Polygon’s external rotary broach tool holder is the perfect solution for lathes, mills and turning machines. Less clunky than traditional screw machine era broach holders, Polygon’s innovative external broach holder streamlines the set-up process and includes new features to save you time and money. Do you need to make hexagon or square forms in your precision metal products? Do you need to machine an external form on the end of a shaft or bar? Polygon Solutions’ Rotary Broach Tool Holder for External Forms is ideal for machining accurate forms that have relatively small amounts of material removal per side. Hexagons, knurls and serrations are ideal forms for external rotary broaching. Polygon’s modern rotary broaching cutting tools can be used on lathes, malls, and CNC turning machines. Parts that are suitable for external rotary broaching must have a chamfer, room for chips to curl up and short form lengths usually up to 2x the diameter or flat-to-flat dimension. Aluminum, brass and mild steel are good work piece materials. Tougher materials may also be broached but with reduced tool life. Part preparation should include turning the major diameter slightly below the finished dimension. This will leave a small diameter instead of a sharp corner at the edge of the form. However, this will also result in separated chips that improve tool life and greatly reduce the pressure against the part and the machine. External rotary broaches are made from quality M-2 high speed steel, and include a rake angle and back taper. The external broach holder is made with the same components as Polygon’s award winning and innovative GT Series broach holder. 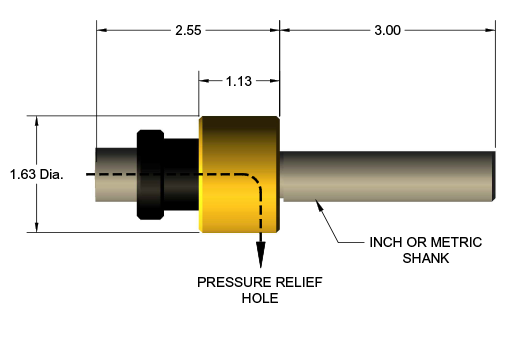 The external broach holder features sealed bearings which require no greasing, adjustment free design for fast set-up, and a pressure relief system to alleviate any hydraulic pressure created by cutting oils or coolant. 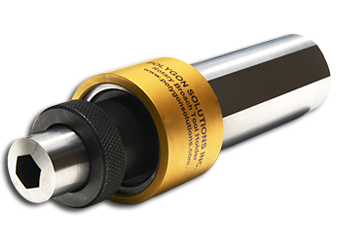 External rotary broaches for forms with a major diameter smaller than .300” can be made to fit Polygon’s standard GT Series Internal Rotary Broaching Tool holder. However, the Rotary Broach Tool Holder for External Forms has greater capacity, and can be used with broaches for forms up to .600” major diameter. The external rotary broach tool holder is available with a variety of straight shank sizes to fit your machine. Speeds and feeds for the external rotary broach tool holder are the same as those recommended for internal rotary broach holders. Feed rates of .002-.003 IPR and speeds of 700-800 RPM are typical. Although coolant and cutting oils are not required for rotary broaching due to the low amount of heat generated, they may be used to improve lubricity at the cutting edge of the broach. Polygon’s adjustment free design and easy set-up are ideal for novice and expert machinists alike. The rotary broach shank is usually fastened into a tool holder block with two set screws. The broach also locks into the holder using a set screw. Alignment is already set because of the fixed length of the broach. We’re confident that the external broach holder can be the best solution for the form required at the end of your precision shaft or bar product. The GT external rotary broach holder is available with a variety of different straight shank sizes and spindles to fit your machine. Polygon’s external rotary broach holder does not require any adjustment and is designed with an easy plug-End-play feel. The fixed length broach is locked into the spindle with a simple set screw. The GT external rotary broach holder is suitable for experienced machinists and new operators. No machine is prefect, and many have slight misalignments between the part and the tool holders. Polygon’s innovative external rotary broach holder is designed for this situation and has a small amount of endplay. The high quality bearing allows the broach to center itself in the chamfer before broaching the finished hole. 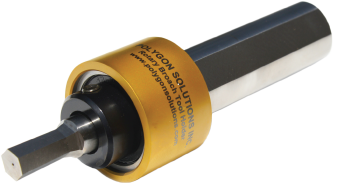 One year warranty is available on all GT External Rotary Broach Tool Holders from Polygon Solutions. We are the only company in the rotary broach industry confident enough in our tool holder to offer a full 1 year warranty against bearing failure.